Has anyone seen the Target Exclusive ESB cases? xbox_jeff wrote: Im sure some have been found, I saw one on ebay. Seems to be more people showing off their 1/72. Perhaps they are just more excited about the 1/72, but, I expected many more people showing off their Fetts. One was top middle and the other was bottom middle. 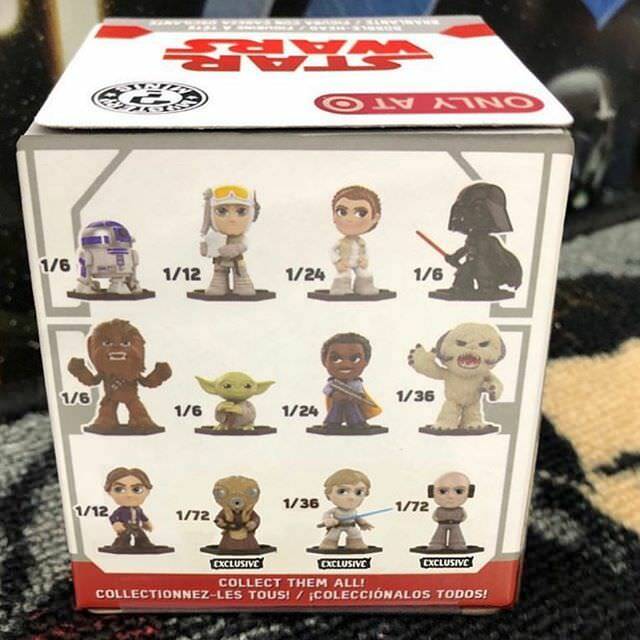 AnyGivenFunko wrote: Has anyone seen the Target Exclusive ESB cases? I'm wondering the same thing. I just need target's three exclusives and I'm done. May the Force Be with You: 1/36, 1/72 and 1/72! Grex54 wrote: I'm wondering the same thing. I just need target's three exclusives and I'm done. Yeah, I just saw a picture of the target ratios. This is going to be a pain. This truly may just be the straw the breaks the camels back. I really don't mind having 3 separate retailers getting 3 different exclusives - the hunt really is part of the fun - but for me personally Target has been an absolute nightmare to deal with over the past several months and they continue to get worse with each exclusive. Three quick examples of what garbage Target is and why Funko has dropped the ball by both allowing them to be such a major partner and making these ratios so ignorant. 1. When the Spiderman set hit Target I bought an entire case only to realize that for some reason Funko decided it would be awesome for collectors to get the possibility of an entire retailer exclusive case without a single retailer exclusive. IF THE RATIOS DON'T ALLOW FOR 1 EXCLUSIVE THEN CHANGE THE DAMN RATIOS! And guess what here we are again where multiple cases assortments will be void of a single exclusive. 2. When the Deadpool minis came out Target changed their policy to only allow you to buy 1 individual mini and I instantly decided I wouldn't even bother buying a mini from that set. Look at what Target just did yesterday with the Ad Icons stuff. Not 1 per style per person but 1 Ad Icon period. It's crazy they can't figure it out and get it right. 3. Target will never restock their exclusive cases. How many series have we all seen now where there is one single case of exclusives then multiple restocks of standard assortments. Funko wants to give Target two 1/72s and then give collectors a single case per store to attempt to find them. Total BS! Bottom line this is a HUGE win for the eBay flippers and another sign that Funko has lost their way when it comes to Mystery Minis. PS: After going on a few extensive hunts I finally found all the Hot Topic and Gamestop exclusives - I found it quite enjoyable completing the set up until this point and was already dreading Target but finding out these ratios today ruins it. Ugh, that's frigging ridiculous! Funko should REALLY cop a lot of flack for this... TWO 1/72 exclusives?!?! They're just getting worse and worse! I'm crossing my fingers and hoping this is a misprint. There have been plenty of times Funko has stated that a figure is not in an exclusive assortment, but then it ends up appearing in the case. Didn't it just happen with Rick and Morty Series 2? Really hoping IG-88 is still in there and the Lobot is really a 1/12 or something. Wishful thinking, but let's see what people start pulling. My hot topic shipment came in today too. Four R2s, 3 Chewys, two Wampas, and a Yoda. Didn't have the 1/6s, so it wasn't a total waste. Just disappointing. I guess it's a good thing they cancelled my order? For the target exclusives I don't understand why they didn't replace the common luke with the exclusive. They did that with the hot topic han. They should have at least kept the ratios similar to the other two stores. With 1/12 luke, 1/36 1/72 lobot or zuckuss. Just a real mess unfortunately. Grex54 wrote: For the target exclusives I don't understand why they didn't replace the common luke with the exclusive. They did that with the hot topic han. They should have at least kept the ratios similar to the other two stores. With 1/12 luke, 1/36 1/72 lobot or zuckuss. Just a real mess unfortunately. They also did it with the GS Leia. They royally screwed up here if these ratios/pulls are accurate. Yea those Target exclusive ratios are an absolute nightmare! Damn, two 1/72 Target exclusives. Avid Game of Thrones, Star Wars, Lord of the Rings, and Funko Fan! Congrats! I was able to get a 4-Lom for a nice price in one of my groups, so no more searching for me. Glad my info was correct though haha! Enjoy! I haven't started in on this line yet (I'm afraid, really; my wallet sincerely hates me for all the recent Harry Potter MM's series 3 excessive purchases, and I have a record of exceedingly bad luck picking out minis). 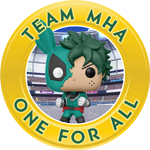 If anybody has any commons they'd like to sell (with packaging, preferably) to me for reasonable prices, please PM me. Also, my top exclusive wants are Bespin Leia and Hoth Han (just FYI!). Thank you! SDCC Solo trooper is on Amazon. You can lock that one down cheap. Hopefully I can get those Troopers (Snowtrooper and AT-AT Driver) at less than an arm and a leg. I've found IG-88, Bossk, and 4 LOM. Just need to hunt down Boba and Dengar and Zuckuss, I think. I hope common cases start rolling out a lot more. Seems Dengar and Boba are difficult to find... and people on eBay are taking advantage. Not many at all can be found, and the few listed are way jacked up in price. Has anyone seen Target cases yet? My local store hasn't and they still have 4 solo minis that have been hanging out forever. yokofox33 wrote: I hope common cases start rolling out a lot more. Seems Dengar and Boba are difficult to find... and people on eBay are taking advantage. Not many at all can be found, and the few listed are way jacked up in price. Bossk prices were higher....I admit that I caved and bought Boba and Bossk...I can't take hunting these down anymore. I'm fearing how much Zuckuss will be. I'm still kicking myself for passing on an eBay listing for Boba when these first started appearing in the wild for like 25 bucks. I should have known he would have been the most sought after of the minis, but I didn't pull the trigger figuring even a popular 1/36 could be found for a reasonable price. Blah! I am positive the price on Boba will come WAY down. The common cases have barely even hit retailers shelves yet. Once they are everywhere a 1/36 from that set - regardless of character - will be obtainable at a fraction of the current prices. Patience is the key for a common set like this...it's the retailer exclusive ones that'll jump up once their allotments are gone but commons will be around for a long time. I've spotted regular retail cases at FYE if anyone is looking for them. That's how I see it too. In my area every Walmart put out four cases of the Solo commons. 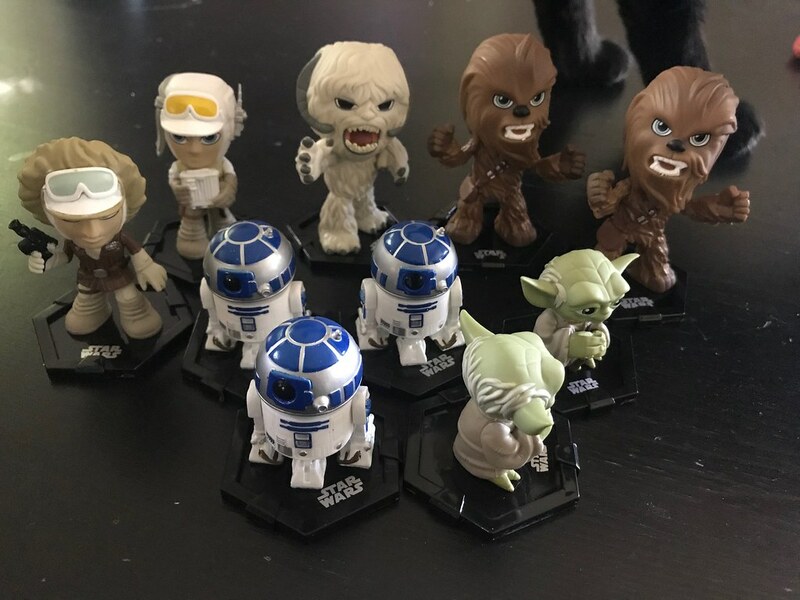 Barnes and Noble, Michaels, comic shops, hobby shops, basically any place that carries Mystery Minis is a threat to put out a box of the Empire commons. Target is the one to worry about, and for me Hot Topic. I only have 1 HT within an hour from me, and I've been checking it several times per week like a complete psycho. Finally they get their box in this weekend and the first figure I weigh is a Wampa. That was crushing. But I'm not out of it yet; they re-stocked the regular SW minis like three times at least. I've got a wampa (1/36) and lando (1/24) I'm looking to trade for one Snowtrooper (1/36). Let me know if you have a snowtrooper you're willing to trade. 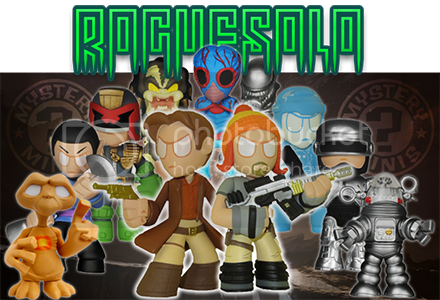 I've managed to get all of them except Boba Fett, Dengar and the 3 Target exclusives. The sweet spot does seem to be top and bottom middles. Were there any known sweet spots for rares/exclusives in the three previous Star Wars series? I need to go back and fill some of those in and I've been seeing a lot of cases at Walmart and elsewhere. MarvelPopFan75 wrote: I can not deal with this before SDCC, and I was hoping to cut down on my growing mini addiction. You shall not PASS (these up)! At least this go around has R2-D2, if there aren't 4 1/6's in this set it might not be that bad. I assume you now know just how awful these cases are?? Tyrannicus wrote: I've managed to get all of them except Boba Fett, Dengar and the 3 Target exclusives. The sweet spot does seem to be top and bottom middles. Where are you located? I've been searching for the Target exclusive, but yet to find a case. Kansas. No sign of the ESB common case or the Target case at all here. I see a lot of common Solo cases though, and even a common case of the original Star Wars set. Thanks for the reply. I read your post incorrectly. I thought you found the three target exclusives. I've only seen the ESB common cases at local comic/toy stores or Boxlunch. I just need the 3 Target to complete the set. I’m still waiting for these to hit my local Targets.